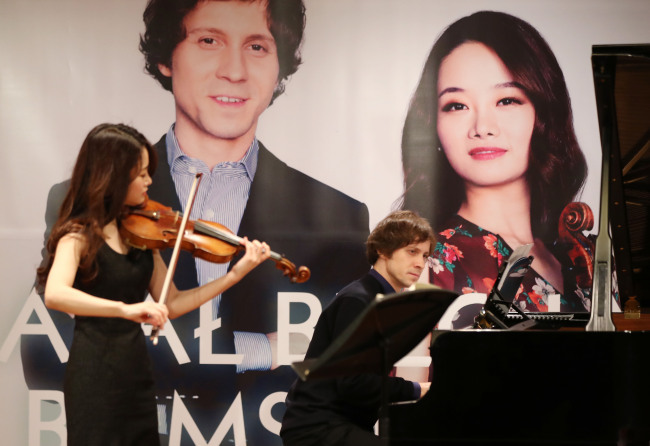 Polish pianist Rafal Blechacz and Korean violinist Kim Bomsori are to set off on a worldwide tour with a recently released album. The album, released under the Deutsche Grammophon label in January, has a French and Polish flair. The track list includes Faure’s Violin Sonata No. 1 in A Major, Debussy’s Violin Sonata in G Minor, Szymanowski’s Violin Sonata in D Minor and Chopin’s Nocturne No. 20 in C Sharp Minor, arranged by Nathan Milstein. Following performances in Poland, the duo is slated to hold a series of concerts in Korea from Feb. 21 to 23. The Seoul performance is slated for the last day of the tour at the Seoul Arts Center. The program includes the Faure, Debussy and Szymanowski pieces from the album as well as Mozart Violin Sonata No. 24 in F Major. At a press event Tuesday at an art hall in central Seoul, the two performed Chopin’s Nocturne No. 20 and Mozart’s Violin Sonata No. 24. Kim’s dramatic performance shined, stably backed by Blechacz’s virtuosic, interpretive performance. The two artists’ musical relationship began two years ago. Blechacz, the winner of the 2005 International Frederick Chopin Piano Competition, personally contacted Kim after watching her perform at the 2016 International Henryk Wieniawski Violin Competition, where Kim took second place. Kim recalled that she was worried at first, as Blechacz had no previous experience in chamber music. There were no references that she could review. “But rehearsing Faure’s sonata together for the first time, the collaboration was amazing. After that, I was so immersed (in the collaboration) that I do not even remember how it continued,” she said. Kim explained how attached she was to the sonata piece. She requested the piece be included on the track list. “I always thought, if I were to release a debut album with piano collaboration, I would include Faure’s sonata. It was important to find the right pianist. Blechacz reached out to me, and I think this is a great opportunity as he has a thorough understanding of French music,” she said. The two musicians, both in their early 30s, appeared to be close, casually exchanging jokes during the press event. During the preview performance, the two often held eye contact. “It is important to find a music partner who thinks in a similar way. (Through the partnership) you can create beautiful and individual interpretations,” Blechacz said. The duo is scheduled to hold concerts in Italy, Spain, the US and more. The collaboration is to continue until 2020.